Something we very much like to do but haven’t done in quite some time is to throw a night time dance party. 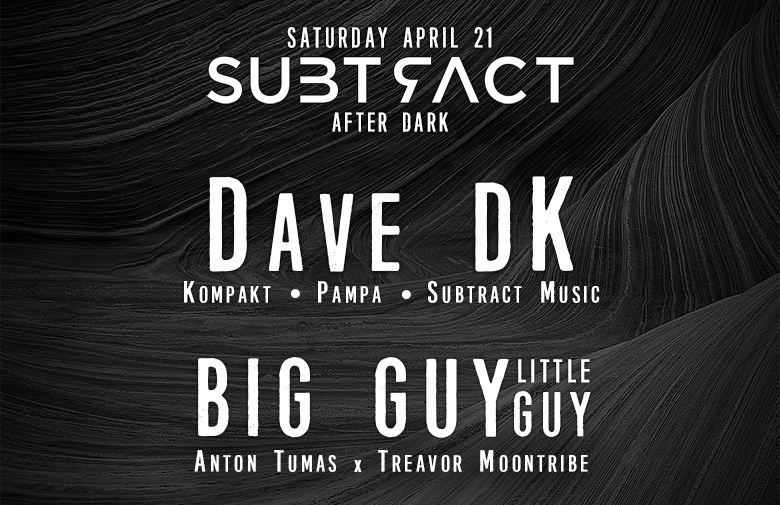 This one goes LATE, and features the latest addition to the Subtract label roster, the legendary Dave DK. Hailing from Berlin, he’s released on labels like Kompakt, DJ Koze’s Pampa, Moodmusic and many others. Joining him is a long-awaited return of BIG GUY little guy, with Anton Tumas and Treavor Moontribe itching to play the darker shades of techno. Techno is definitely the theme of the night, with Brad Moontribe and a solo set by Anton Tumas rounding out this line up.